The Anvar are religious fanatics, which is beyond doubt or contention. They are ferocious in defence of their beliefs and their way of life, and maniacal in their desire to spread the Word of Solar to the other races. Whilst not a warrior race in its strictest sense, their natural physical design and capabilities make them extremely effective shock troops and defenders, their immense strength and resistance allowing them to shrug off wounds that would fell a human or even cause a DragonLord some worry. Physical Description: Anvar bodies are formed of platinum or other precious metal, with nothing beneath, their limbs seeming to melt and reform as they move, yet they are cold to the touch. Though they can speak and they appear to breathe, Anvar actually have no internal organs that have ever been found. Their eyes glow from within, as if a fire has been lit within their skull, the colours differing with the individual Anvar. They have no use for human food, simply desiring metals for sustenance. Massive beyond even the tallest DragonLord, the Anvar are the tallest of Tal'Vorn's many races, with some of them even topping twelve feet. The average, however, is a somewhat less impressive eight or nine feet in height. Personality: Anvar live in tribal groups, banding together for protection and to help in gathering the metals that all Anvar need to grow and to survive. They follow a single leader, a chief with the greatest knowledge of the Word of Solar, their religion central to their everyday life. Each Anvar can spend up to fourteen hours a day in prayer, eight in sleep and up to eight of the hours remaining in the long Tal’Vorn day searching for metal. As a Tal’Vorn day is only 34 hours long this is a substantial level of dedication to their God. Whilst fiery and devoted, Anvar can also make for steadfast friends and allies, typically being unafraid of hardship or strife, viewing it all as just another way of proving their worth in the eyes of Solar. Religion: Solar is known to be a benevolent God, His light allowing life to flourish upon Tal’Vorn, yet His Anvar have often committed atrocities in the name of their faith. How can a truly good God permit this to occur? The answer lies with Solar Himself, the God’s own personality, if such a term can be used to describe how a living God thinks and acts. Solar does not involve Himself in the petty squabbles of the other Races, simply seeking out the destruction of the creatures of the Dark One. Solar has been aligned against the Corrupter since before Tal’Vorn was found, the two Gods warring between the stars for generations. It is this opposition, the Light against the Dark that drives the Anvar, the Eaters of Metal simply desiring their deities’ victory over the darkness, which will then usher in a time of eternal light and peace for all. If some non-believers have to fall along the road then so be it, the Anvar will accept it as required casualties, deaths for the sake of Solar Himself. Relations: Anvar often have difficulty getting along well with many of the other Races. However, sometimes their very natures can help them in discovering common ground. DragonLords, Elves and Soulless especially respect the Anvar for their religious devotion. Conflaris, however, in spite of being deeply religious, are in perpetual competition with the Anvar for Tal'Vorn's scarce ferrous metals. As is typical of them, the Fae and Mermen tend to get on well with the Anvar, just like they do everyone. Humans are, as usual, something of a rogue element, with some getting on well with the Anvars outlook, and some steadfastly refusing to accept the religious mania of the Eaters of Metal. Territory: The Anvar have no real territory of their own, living as they do in tribes. They do, however, have general areas that they roam. Anvar favour wide, open spaces which can accommodate their large frames. Whilst seemingly ponderous, Anvar will travel tirelessly for many leagues in a day, so Anvar Tribes, carrying all of their belongings upon their back, will travel quickly across most terrain. They typically seek out isolated areas of bare stone and rock where they will surface mine for minerals. As such, they are most often found in the great plains of the Eastern Land, to the north and east of Grath City. 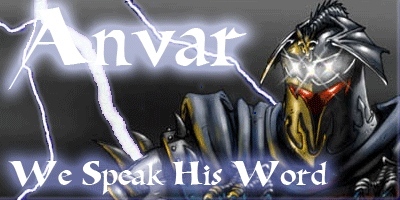 Language: Anvar speak a simple language named after themselves, Anvar. The language itself is supposed to have been taught to them by the God Solar Himself, though given the Sun Gods lack of interest in the mortals of Tal'Vorn, this seems unlikely. What is true, however, is that many of the greater fire creatures, such as Elementals, speak the language as well. The Anvar themselves view the language as holy, making all of their prayers in it. Most of them typically know Common as well, in order to facilitate converting others. Names: Anvar favour simple and straightforward names, typically consisting of one syllable or so. However, because Anvar lack an distinction between the two sexes the names have no gender basis. For example: Al, Cay, En, Ki, Nev, Mer, Sen, Zi. Blessed be Solar’s true light.